Rinnai was already making the best tankless water heaters on the market before they announced their new Sensei line, now they’ve basically lapped the competition. That’s a bold claim, but there really isn’t another way to describe it. Rinnai has made significant upgrades to their residential and commercial offerings without increasing the price. These new Sensei models are easier to install, easier to use, and more efficient. Here at Able, we’re bringing in two standard residential models, a residential model with integrated recirculation, and a commercial model. With a focus on saving time and energy, there’s plenty for both contractors and homeowners (or business owners!) to love about the Sensei so let’s jump right into a breakdown of what’s new and improved. One of the major goals with the Sensei lineup was to create a better tankless water heater for contractors. This meant looking for ways to streamline the installation and maintenance processes while maintaining the quality and efficiency for which Rinnai is known. To accomplish this, Rinnai developed the most flexible venting system in the industry. Their focus was on increasing the number of compatible vent systems and materials. With a total of fourteen possible vent configurations and nine acceptable manufacturers, it’s safe to say that they succeeded. All of the above setups can be terminated either vertically through the roof or horizontally through a wall. The Sensei supports 2″ vent runs up to 65′ and 3+” vent runs up to 150′. PVC, CPVC, and PP are all acceptable materials. 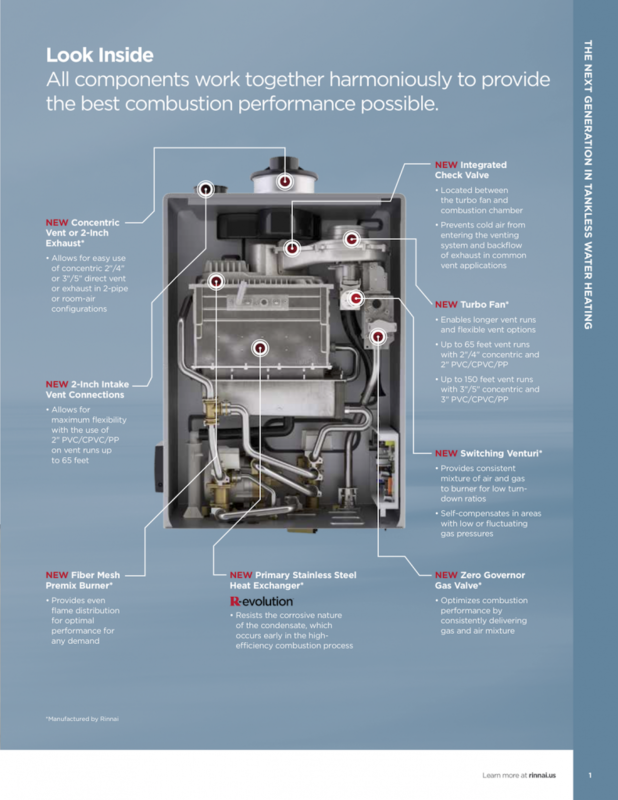 The combustion system was one of the areas that Rinnai singled out for improvement in their Sensei line. To start, they manufactured a new zero governor gas valve, switching venturi, and fiber mesh premix burner. These components improve consistency and performance across a vast range of demands. A new integrated check valve gives the Sensei its remarkable -22° F freeze protection. This valve prevents outside air from infiltrating the system. It is paired with logic controls that activate the unit in extreme cold to ensure that your clients have hot water in any weather. Finally, Rinnai redesigned their heat exchanger. Dubbed the R-evolution, this primary heat exchanger is made entirely from stainless steel. This design gives the Sensei units extreme durability, allowing them to withstand the rigors of the condensing process with ease. Rinnai started with a great product and made it even better. Across the board. Sensei tankless water heaters are available now at Able! The Lowest Price Ever on ecobee4 Smart Thermostats!